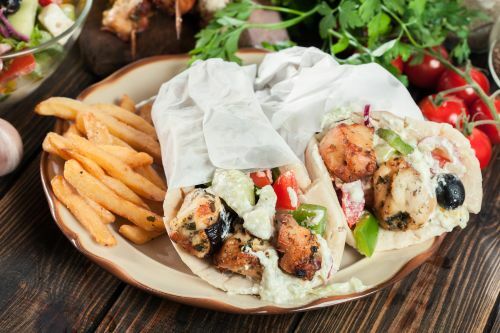 Menulog delivers for Fairfield Tasty Souvlaki so you'll be able to track your courier on a map. Chips, cheese, any choice of lamb or chicken and you can pick your own sauce. Souvlaki of your choice, chips and a can of soft drink or water. Gyros of your choice, pita bread, one dip, chips and salad. Gyros of your choice, salad and choice of dip. Gyros, onion, tomato, chips, tzatziki, mustard and choice of protein. Gyros, onion, tomato, lettuce, tzatziki and choice of protein. Falafel, onion, tomato, lettuce and hummus. Gyros, chips and pop top. Vegetarian souvlaki, chips and a can of soft drink or water. Choice of gyros, chips, tomato, onion, tzatziki, mustard, chips and a can of soft drink or water. Tzatziki, caviar (tarama) or hummus.